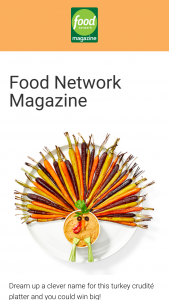 Food Network Magazine – November 2018 Name This Dish Contest – Win a $500 check (ARV $500). carrier. Please contact your mobile service provider with any questions regarding your bill. prize will not be awarded in any form. reserves the right to seek damages from any such participant to the fullest extent of the law. of law rules, governs the Contest and all aspects related thereto.